Style Dispatch 020: GHST RDR Lives! It’s time! As promised, GHST RDR, my collaboration with Toronto’s future fashion pioneers, Plastik Wrap, is now live. Or undead – whatever! These two pieces are available for custom orders only, and at 189.00 and 149.00 CAD, you will agree this is one fabulous deal. And I don’t use the word “fabulous” in vain, ever. It’s so gratifying to finally offer this jacket and skirt to you. Having only T-shirt and commercial merchandise designs under my belt of late, bringing this mini-line to life was an exciting new experience. Though fashion design is something I’d always been interested in, I hadn’t created clothes from start to finish since, eesh, college. Lacking tailoring expertise necessary to create the outfit of my design-y dreams, I knew that Plastik Wrap’s Adriana was my ideal partner. I’ve known Ada and worn her clothes for years now – they always, always fit just right. 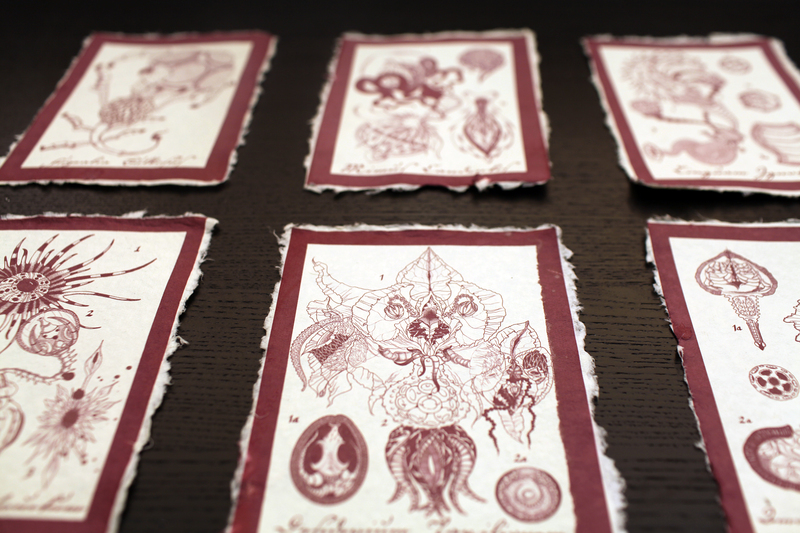 We began the collaboration back in November, when I sent her two of my sketches from 2006. A multitude of emails, a dozen fabric swatches, and several curious prototypes later, GHST RDR is real. 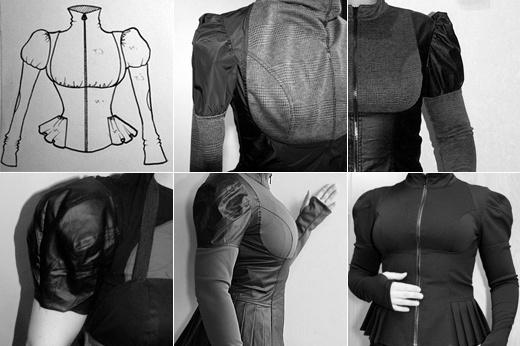 Here’s a look at the creative process behind the jacket. We went through several fabrics, sleeves, necklines and pleats, before arriving at the final version. If my calculations are correct, Ada [pictured above] is the owner of at least four early versions of this thing. A glance over my inbox tells me it took roughly 100 emails to complete GHST RDR, start to finish – not a single meeting or phone call needed. Thanks to Coilhouse, I’m used to collaborating remotely, but still find this amusing and appropriately Of the Future. Now, what are you waiting for? Go on, GHST RDR is ready for you and mama needs a new jet pack. And damn, I was so excited about these pieces, and I figured they would be available in plus sizes since they are being *custom-made*, but no such luck. No fashions for the fats. Zane – thank you! The name is a nod to many things we love, glad you dig it. ChubbyBunny – have you contacted Adriana directly to see about a plus size yet? If not, I suggest you do so. I’m in love! Is this a limited time sort of thing, or can I save up my pennies? Getting ready to get my contact on – thanks!